Gazeta is a typeface created by Ricardo Santos and published by Vanarchiv which was designed to be suitable for editorial use. 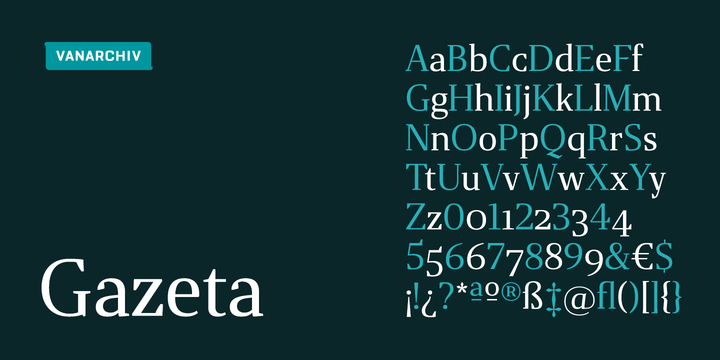 It comes in 10 weights (from XLight to XBold) and italics, useful Open Type features and language support. It is a versatile font which work’s great on small sizes and it has some options for text sizes. It is ideal for typographic use, editorial, magazene, book etc. Enjoy! Price: starting from $21,00 for one font to $150,00 for all 20 fonts. A font description published on Thursday, October 5th, 2017 in Fonts, Ricardo Santos, Vanarchiv by Alexandra that has 1,819 views.